This Green Thai Curry is a quick, one-pot vegetarian noodle dish. 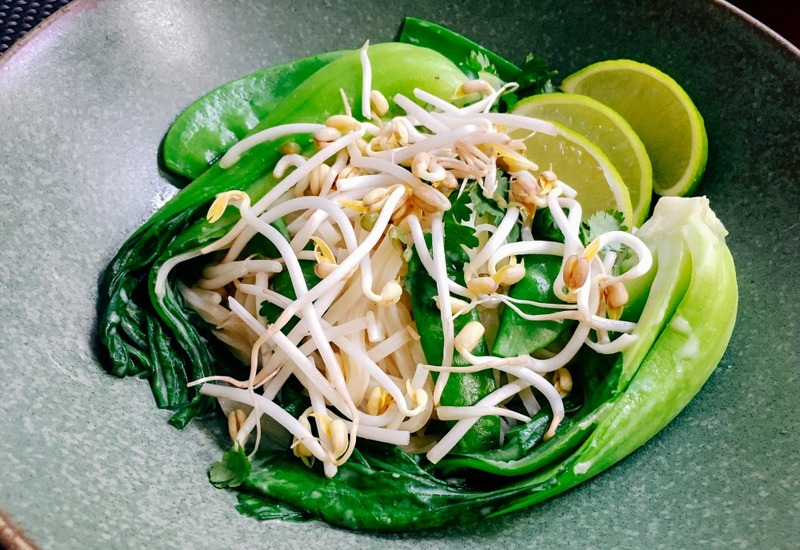 Snow peas, bok choy, and bean sprouts give the dish a hearty veggie boost. While the rich flavors come from creamy coconut milk and concentrated green curry paste. The dish is finished off with fresh cilantro and a light squeeze of fresh lime juice. The flavors are complex, but the recipe is easy. Everything comes together in under 30 minutes and can be done in one pot. This vegetarian and vegan dish is also gluten-free and dairy-free. Add shrimp, scallops or shredded chicken to this dish for non-vegetarians looking for a protein boost. Pack leftovers for lunch the next day! Per Serving: 768 calories; 71g fat; 34.4g carbohydrates; 12g protein; 0mg cholesterol; 373mg sodium. I make Thai curry all the time, but this was my first time trying it with bok chow and snow peas. It was really good, definitely authentic tasting and really delicious with rice. Yummy vegetarian noodles that are light but will still leave you feeling satisfied. I add shrimp to my husband's bowl and keep the vegetarian version for myself. I also like to top it with extra cilantro. Delicious!